Saeb Erekat published an anti-Israel screed in Time claiming that Israel is not interested in peace and the PLO, trying to merge with terrorist group Hamas, is. Frankly, it is difficult to understand how anyone could expect us to negotiate with such a government. And yet we have, in good faith, offering concession after concession for the sake of peace. The list of Israeli concessions for peace since Oslo is quite long – giving full autonomy to parts of Judea and Samaria, accepting the idea of two states for two peoples (something even Yitzchak Rabin refused to do,) offering unprecedented concessions of disputed land even in Israel’s capital. These concessions are well documented by the Israelis who offered them and the Americans who were there at the time. But can Saeb Erekat name a single public concession that the PLO has made to Israel since the Oslo accords? Erekat says they have offered “offering concession after concession for the sake of peace.” So it should be simple for him to name, say, one of them. Saeb Erekat heads the PLO Negotiating Unit. If he offered a concession remotely comparable to what Israel has conceded since 1993 in the possibly reckless pursuit of peace, wouldn’t we know what it is by now? 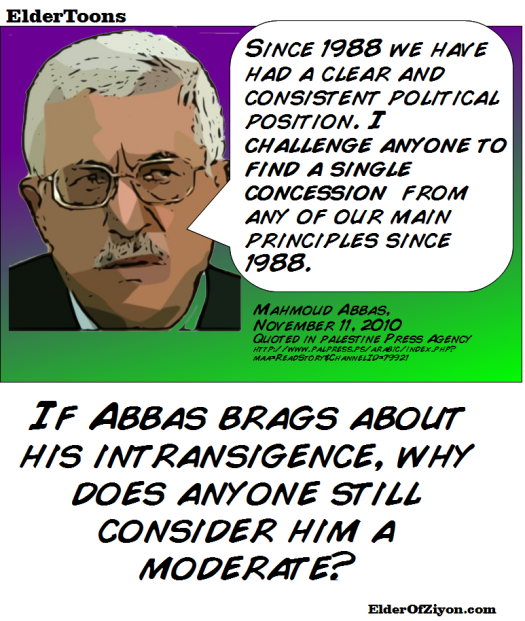 It will be hard for Erekat to specify a single solid concession that he claims he has made – because his boss Mahmoud Abbas has publicly bragged, in Arabic, more than once, that he has not changed the PLO’s positions one iota since 1988. So we have proven for the umpteenth time that Saeb Erekat is a liar. Too bad the Westerners whom he talks to don’t have the guts to call him on his litany of lies that continue to be spouted every time he opens his mouth. .